Reuters news agency has confirmed that it is being bought out by the Canadian data company Thomson in a deal worth about £8.8bn ($17.5bn). The deal comes as Rupert Murdoch's News Corp is stalking the Wall Street Journal - one of the most famous names in financial reporting. But why are news and data companies circling each other and why are they suddenly so attractive? 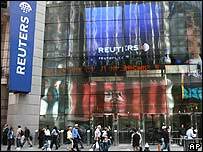 Reuters is a global news organisation, with its head office in the UK. It is best known for its news coverage and photographs. However, these account for only about 10% of its earnings. Selling financial news and data to companies and media organisations brings in the bulk of Reuters' money. Along with Thomson and Bloomberg, Reuters competes in the "terminal" market, providing news and financial data on stocks, currencies and bonds to banks, traders and brokerages. Other notable wire services include Associated Press, Agence France-Presse and the UK's own Press Association, as well as a number of smaller services. While covering business issues, none of these specialise in financial news. Formerly a newspaper publishing empire (which at one time owned The Times), Thomson also branched into fields including a travel business before focusing on electronic publishing. Thomson Corporation is a global information company, specialising in financial data, as well as sectors such as law, accounting and healthcare. Its head office is based in Canada and more than four-fifths of its earnings come from its North American operations. Last year, it bought AFX, another financial wire service, based in the UK. So why is Thompson buying Reuters? Reuters and Thomson say there is "a powerful and compelling logic for the combination". And analysts believe a merger will make a lot of sense. Thomson has the cash to finance a takeover, they say, and it already has a news and financial data operation. There is also the belief that, by combining their operations, Thomson and Reuters will be better placed to take on their US-based rival Bloomberg. The companies say they expect to save $500m within three years - although Charles Peacock, an analyst with Seymour Pierce, believes that is a "conservative estimate". In the past years, Thomson has been expanding its non-data business, and Reuters will complement its news operations in the US and AFX in Europe, analysts say. Any chance of the deal falling through? The market is pretty confident that it will pass without a glitch. However, it still needs approval from competition regulators and some analysts have voiced concerns that it may run into obstacles. As they say in business, there is no such thing as a done deal. But what about Reuters' news independence? The deal has won the backing of the Reuters Founder Share Company. The group, run by 15 trustees, holds a single golden share in the company, giving it the power to block any hostile takeover of the firm. It forms part of a complex system of ownership at the firm, where rules also restrict any one person owning more than 15% of the company. Woodbridge, the investment vehicle owned by the Thomson family, will be granted an exemption to the 15% shareholding limits so long as it continues to be controlled by the Thomson family. Woodbridge will own 53% of the new Thomson-Reuters group. So, will the Reuters brand will be preserved? The Reuters name is among the most famous and will remain. The companies say that the enlarged group will be called Thomson-Reuters, and that all of the financial news and data business would be branded Reuters. Are there other deals in the offing? No. News Corp, controlled by media tycoon Rupert Murdoch, has made a $5bn bid for Dow Jones, Reuters' US rival and publisher of the Wall Street Journal. The Thomson-Reuters tie-up was announced after this deal, though it was claimed by the companies that it was not in response to News Corp move. What are the motivations of News Corp? Again, it seems to be about new markets and the consolidation of the industry. Analysts say that acquiring Dow Jones, which owns Dow Jones newswires, will bolster News Corp's plans to launch a business news channel later this year under its Fox TV brand. The move would also extend News Corp's reach in Asia, where Dow Jones publishes the Wall Street Journal Asia and the Far Eastern Economic Review. News Corp also owns Hong Kong-based broadcaster Star TV, but has so far had little success in penetrating the fast-growing media market in mainland China. Is the News Corp-Dow Jones deal likely to go ahead? 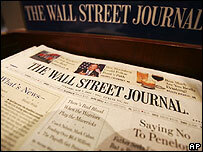 Dow Jones' biggest shareholder group has said it is opposed to the News Corp bid. A bidding war is likely, with General Electric - which owns the business news network CNBC - and the Washington Post being mentioned among potential counter-bidders. There may be another twist in the tale, with news that the New York Attorney General and the Securities and Exchange Commission are looking into trading patterns in share options ahead of News Corp's surprise bid.